Johnny Depp’s lavish spending-including $3 million to blast author Hunter S Thompson’s ashes from a cannon led him to the brink of financial ruin, according to an explosive lawsuit filed Tuesday. Over the best part of two decades, the 53-year-old actor has been spending $2 million a month, according to The Management Group (TMG), which is suing the star in Los Angeles for an unpaid loan. The “Pirates of the Caribbean” actor is alleged to have forked out $75 million on 14 homes, including a 45-acre (18-hectare) French castle, a chain of Bahaman islands, several Hollywood homes, penthouse lofts in downtown LA and a horse farm in Kentucky. Since 2000, the Oscar-nominated actor has spent $18 million on a yacht, bought 45 luxury cars and shelled out almost $700,000 a month on wine, private planes and a staff of 40 people, according to the lawsuit. 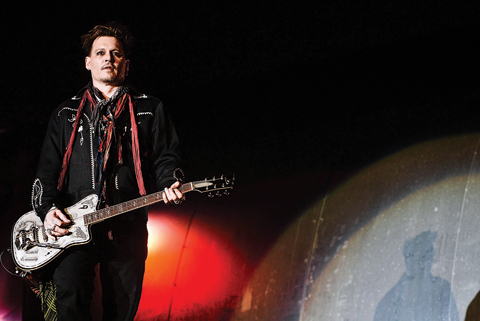 Beverly Hills-based TMG says Depp has accrued more than 200 artworks by Warhol, Klimt and other masters, 70 collectible guitars and a Hollywood memorabilia collection so extensive it is stored in 12 locations.